If your Samsung Galaxy Tab 3 8.0 (SM-T310) has a broken screen Mountain Stream are here to repair your tablet for you. The screen/digitiser and LCD on these devices are a fused unit. Basically they are glued together with absolute precision by the manufacturers. While it is technically possible to separate the Digitiser and LCD, the possibility of damaging the LCD and the care and time required do not make it an economically viable repair. We are also able to replace smaller components such as cameras, speakers, flex cable, micro USB charging port etc. Please see below for our fixed prices for repairs. Prices are inclusive of parts and return standard postage or personal delivery. 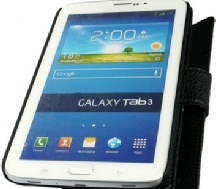 For other Samsung Galaxy Tab 3 8.0 repairs please request a quote by email, phone or by using our enquiry form. ALL PRICES BELOW ARE INCLUSIVE OF PARTS, LABOUR AND RETURN OF YOUR SAMSUNG TAB 3 8.0 (SM-T310) IN PERSON OR BY POST. PRICES DO NOT INCLUDE ANY PRE-REPAIR DIAGNOSIS. FOR A PRICE ON REPLACING ANY OTHER SAMSUNG GALAXY TAB 3 8.0 (SM-T310) COMPONENT PART PLEASE CALL, EMAIL OR USE OUR ENQUIRY FORM.